Back in the days of Bart Starr and Vince Lombardi, even before Superbowl I, Cathy’s parents (Henry and Willa) acquired five season tickets on the 50-yard line. Henry and Willa had seven children: Amy; Bill; Cathy; Dan; Erica; Faith; and Gina. Bill and Cathy each have one child. Faith and Gina have no children. All seven of Henry and Willa’s children were living when Henry and Willa died, so their real estate and investments were divided into seven equal shares. In addition, the seven children have worked out a system for sharing the Packers’ tickets—they divide up the season’s home games, draw straws for choosing game dates, and everyone gets to go to Lambeau Field (and even bring guests) at least once a year. So far, it has been relatively easy. Ultimately, each of the children will pass his or her one-seventh share of Henry and Willa’s property on to his or her own beneficiaries at death, but not everyone in the family is thrilled about that. Bill thinks (and Cathy agrees) that his son should succeed to Bill’s full one-seventh share of the seasons’ games. Amy and Erica think that the grandchildren should instead divide up the tickets in 13 equal shares and that it wouldn’t be entirely fair for Bill’s son or Cathy’s daughter to go to more games than any one of their children. Per stirpes becomes important only where an individual’s children do not all survive that individual. For example, let’s assume that Gina survives Henry and Willa, but all six other children predecease their parents. With apologies to Cathy and her daughter, let’s further assume that Cathy’s child also predeceases, leaving one child of her own (a great-grandchild of Henry and Willa), but the other 12 grandchildren survive. A per stirpetal division of assets instructs us to divide the property at the children’s generation into equal shares so that there is one share for each surviving child (Gina) and one share for each deceased child who has at least one surviving descendant (Amy, Bill, Cathy, Dan and Erica). This gives us six equal shares. (There is no share created for Faith, because Faith predeceased without leaving descendants.) Gina gets her 1/6 share, and now we must further divide the other 5/6. Amy’s children take Amy’s 1/6 share (divided five ways among them), Erica’s children take Erica’s 1/6 share (divided four ways), Dan’s children take Dan’s 1/6 share (divided equally between them), Bill’s child takes Bill’s 1/6 (and does not share it with anyone), and Cathy’s grandchild take’s Cathy’s 1/6 (standing in the shoes of her mother, Cathy’s daughter). Per stirpes produces the same result that would have obtained if all individuals in a family had died in the expected order (parents always predeceasing all of their children) and each individual had left his or her property at death in equal shares to his or her children (or to his or her nieces and nephews if he or she has no children). This is the approach Bill and Cathy (having only one child apiece) think most fair. An alternative approach to per stirpes is a division per capita at each generation (referred to under Uniform Probate Code § 2-106 as “by representation”). Per capita at each generation produces the results that (i) descendants in the same generation are always treated equally (i.e., Bill’s child would not get more than any one of his cousins) and (ii) no descendant of a more remote generation will take more than a descendant of a nearer generation (i.e., Cathy’s grandchild would not get more than one of Amy’s children). 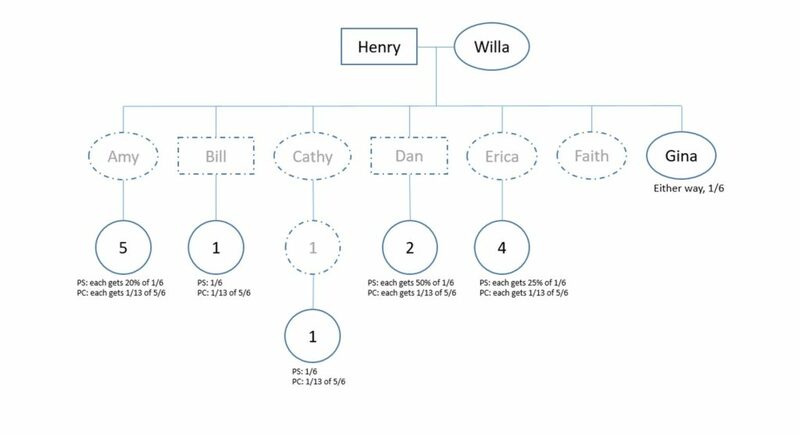 A division per capita at each generation would still give Gina her 1/6, but the other 5/6 would be divided into 13 equal shares, one for each of Henry and Willa’s grandchildren who either survived or had a surviving descendant (i.e., all of them). Each of the living grandchildren would receive his or her 1/13 share of the 5/6 that remains after Gina receives her share, and Cathy’s grandchild would receive the 1/13 share that would have gone to Cathy’s child, had she survived. This is the approach favored by Amy and Erica (having greater numbers of children than their siblings). Because in the case of Cathy’s family, Henry and Willa actually did predecease all of their children, the Packers’ tickets already passed in equal shares. So, although it may not please Amy or Erica, each of the seven children will get to choose how to dispose of his or her 1/7 share of the tickets at death. Estate planners most often use per stirpes, their rationale being that it mimics the result that would flow from a natural order of deaths. Interestingly, a 1988 study by Fellows of the American College of Trust and Estate Counsel (ACTEC) determined that clients overwhelmingly prefer a division per capita at each generation when the difference has been explained to them. That study influenced the 1990 revisions to the Uniform Probate Code that embraced the per capita at each generation approach (but to date, it has had no influence on the preferences of Cathy or her daughter).